An excellent turnout of 28 Southport Waterloo runners took part in Sunday's Seaside 10K which had over 1300 finishers. The race was won by Southport Waterloo's Mark Dunham in 32:53 ahead of Lewis Rooney finishing in 33:14 and Barrow's Ross Campbell 3rd in 33:40. Mark also won the Wirral Half Marathon two weeks earlier. The Women's race was won by Kirkby Miler Jennifer Houghton in 27:21 with Penny Lane Striders Charlotte Sanderson-Rigby 2nd in 28:53 and Melanie Roberts 3rd in 29:56. Behind Mark Dunham for Southport Waterloo, Keith Lunt was 37th overall in 39:33, new runner Simon Coughlin 43rd overall in 39:53, David Wright, 47th in 39:58, Boyd Park, 50th in 40:12, Steve Wilkinson, 55th in 40:38, and Keith Swift, 57th in 40:41. Other male finishers were Jason Oliver (42:27), Paul Hill (43:18), Graham Liu (45:29), Mike Murray (45:31), Malcolm Teale (45:41), Stephen Flanagan (45:58), Carl Pedder (46:10), David Marsh (46:44) and James Brooker (47:21). The Southport Waterloo ladies were led home by Tracey Allan, 5th female in 43:12, followed by Tracey Barlow, 3rd F45 in 46:00, Catherine Fearnley, 3rd F40 in 46:09, Jessica Dean, 1st Under 20 in 46:38, Sarah Lunt (51:39), Sue Stewart, 1st F70 in 53:33, Amanda Bradbury (56:26), Jane Blacklin (56:46), Sophie Bennett (58:39), Heather Goadsby (63:03), Vivian Laird 3rd F60 in 64:21 and Sarah Pickerill (66:58). There were quite a number of PBs and SBs by our runners at Southport, including the winner, so well done to all. Sunday's race brings the club's Grand Prix series to an end. Its been a successful series with 74 runners completing at least one race and 19 completing at least the 5 needed to qualify for awards. Subject to ratification: for the females, Tracey Allan wins with just 6 points from her best 5 races. Both Tracey Barlow and Sarah Lunt tied for 2nd place with 11 Points. Tracey Barlow will take the vet award. In the Men's rankings, Francois Rafferty is the overall winner with 6 points. Keith Lunt is 2nd with 9 points and Boyd Park (corrected result) 3rd with 14 points. With Francois the overall winner, Keith will take the Vet award. Both of last year's Grand Prix champions have retained their title, Tracey for the 7th time. Our most successful Grand Prix champion, however, is Susan Cooper who won the Grand Prix for 10 consecutive years from 1999 to 2008! 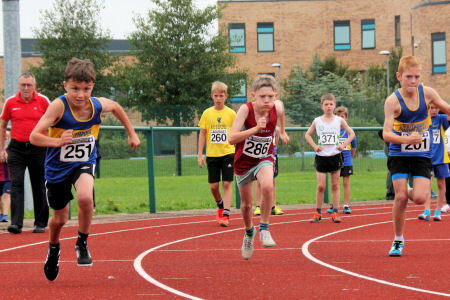 A 22 strong team of athletes, coaches and supporters made the 300 mile round trip to Jarrow in the North East for Saturday's North East Counties Pentathlon Championships and Open for what has now become an established season curtain closer for the combined eventers. 7 athletes were entered, u13 boy Adam Byrne, u13 girls Lauren Byrne and Amber Hughes, u15 girls Katie Piercy and Niamh Proctor, u15 boy Sam Coupland and u17 girl Stephanie Robertson. Unfortunately, Lauren was not able to commence due to an ankle injury. It was Adams first pentathlon and as a first year under 13 he should be very happy with his performance competing against 10 other boys. In the 75m hurdles he was 8th fastest with a time of 16.2s, this was followed by a PB equalling Long Jump of 3.59m moving him to 7th. A High Jump of 1.29m moved Adam to 5th. Adam's highlight will be his Shot of 6.79m improving his club record by a further 20cm, concluding with an 800m in 2:49.85 to finish 5th overall with a points total of 1,057. Amber's last action as a u13 girl was a successful conclusion to what has been a challenging season due to injuries. She was fastest of the 32 girls over the 70m hurdles with 11.58s, followed by a Long Jump of 4.31m. 1.38m in the High Jump saw Amber in 3rd place heading into the Shot where a put of 9.85m moved Amber back into the overall lead. An 800m affected by a strain of 2:52.98 for a total points total of 2,436 an improved club record and the overall win. First year u15 girls Katie and Niamh both pushed themselves hard competing against 20 other girls. Katie completed the 75m hurdles in 13.30s, Long Jumped 4.25m, putted the Shot 8.41m and High Jumped 1.29m. Katie's 800m of 3:00.61 earned her a pentathlon points total of 2091 finishing in 11th overall. Niamh hurdled in 14.91s, a Long Jump of 4.07m was followed by a new PB in the Shot of 6.62m. Niamh's High Jump of 1.29m was followed by her 800m of 2:56.32 for a new PB points total of 1,806 for 15th place. Sam had a good day considering he was not 100% fit. His 80m hurdles in 12.54s was third fastest of the 11 boys. Shot of 9.67m was the best of the boys, moving Sam into first place where he would remain, he also had the best high jump of 1.71m. 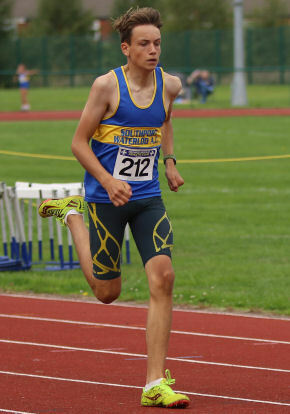 His 5.40m Long Jump was followed by him leading home the boys in the 800m in a time of 2:17.32 for a total points score of 2,617 improving his club record for the u15 boys pentathlon. U17 girl Stephanie has looked fantastic through this season particularly in sprints and horizontal jumps, her attendance at Jarrow more a fun curtain closer as Steph is also coping with injuries. An 80m hurdles time of 14.16s was followed by a High Jump of 1.29m. Steph's 6.65m Shot was a new PB, 4.52m Long Jump and a 'not so fun' 800m in 2:58.58 earned her 2072 points and just missed out on a podium place with 4th place. Ben Johnson continues to establish himself as an outstanding distance runner. Building up to the Berlin Marathon on Sunday, Ben ran a PB 53:53 to win the Caldervale 10 Mile road race on 29th July and he featured in the Manchester International match at Sportcity where he ran a 10,000m in 31:53:80. On the streets of Berlin on Sunday, he ran 2:23:24 to finish 38th overall and 4th Brit. His time was just a little slower than the 2:25:04 he ran in the Great Manchester Marathon in April but very impressive nonetheless. Well done Ben. Ben is currently ranked 13 in the UK with a PB of 2:21:46 from London last year. The last local open Track & Field meeting was held at Wigan's Robin Park Arena on Sunday. Eight of our juniors and one senior took part. Under 11 Lottie Hughes ran 12.9 for 75m and long jumped 2m 85. New Under 13 Ellie Clark ran 11.6 for 75m, 14.3 for 70m hurdles and threw the javelin 17m 47. For someone who only started competing in August, Ellie is showing a lot of potential! Under 13 Amber Hughes ran 12.0 for 70m hurdles, high jumped 1m 35 and threw the javelin 23m 08. Under 13 Lauren Byrne ran 12.8 for the hurdles, long jumped a PB 3m 89 and put the shot 6 metres. Under 13 Adam Byrne ran 16.3 for the 75m hurdles, high jumped 1m 25 and put the shot 6m 52. Under 15 Katie Piercy ran 13.9 for 75m hurdles, cleared 1m 30 in the high jump and 4m 28, a new long jump PB. 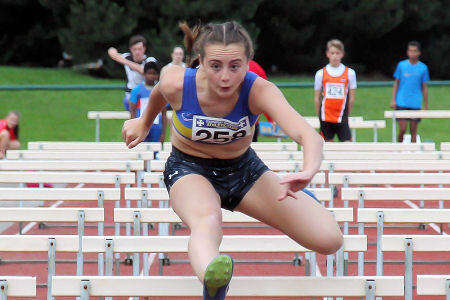 Under 15 Niamh Procter ran 15.9 for the 75m hurdles,. She long jumped 3m 87 and put the shot a PB 6m 13. Under 17 Luke Suarez took part in the triple jump, an event he hasn't previously competed in. He cleared a very respectable 11m 23. Finally, Katy Coupland had a best throw of 26m 47 in the Snr Women's discus. 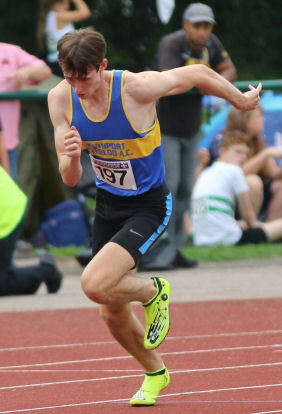 Meanwhile, Sam Coupland was representing Merseyside at the English School Combined Events Champs in Bedford where coach Barrie Hughes was Merseyside team manager. Sam ran a PB 12.29 in the 80m hurdles, put the shot 9m 79, long jumped 5m 16, high jumped 1m 62 and ran 2:18.72 for 2511 points. Just the Jarrow pentathlon to come to close a very busy Combined Events season. The Wirral Half Marathon was run on Sunday from New Brighton as part of the Whistle Stop Tour of Wirral series of races. The winner was Southport Waterloo's Mark Dunham in 72:03 with Lewis Rooney, who does his interval training at Litherland Sports Park, 2nd in 74:27. Alex Waddelove was 18th overall in 1:26:10 (chip time 1:24:29), Stephen Ward 33rd in 1:28:42 (1:28:40) and Vet 65 Mike Walker 72nd in 1:34:46 (1:34:37); four Southport Waterloo runners in the top 100 of a field of over 800 finishers. James Brooker ran 1:48:29, David Marsh 1:48:57, Andrew Bridson 1:55:19 and Rob Busby 1:55:31. In the female finishers, Louise Busby ran 2:03:09 (2:02:40) - her 2nd half marathon in a space of 8 days, having running 2:09 in Heaton Park on 1st September! Emma Hopwood ran 2:36:41 (2:34:49) - that's around 30 mins faster than she ran in Southport or the Liverpool Rock 'n Roll earlier this year! The event also included a 10K but there was no Southport Waterloo participation as far as I can see. Elsewhere, Ian Kilshaw ran the Newcastle to South Shields Great North Run in 1:47:47; that's Ian's 6th consecutive year in the Great North Run. The September Blackpool Open T&F Meeting was held on Sunday, in very much improved weather conditions over Saturday. But we did have several showers so it was too soon to put away the wet-weather gear. Blackpool used to put on two September open meeting and they were a great attraction to Southport Waterloo athletes in the '90s and '00s. In several years, we would compete in the Open, enjoy a team meal together and head off to spend the rest of the evening at Blackpool Pleasureland. Today, we had just 6 athletes although the meeting itself was well attended as it always is. The highlight for Southport Waterloo was Sam Coupland's 3m 05 pole vault to extend his Under 15 PB and club record. He won the competition. Under 20 Darion Moore competed in 100m, 200m and 400m. He was 3rd over 100m in 12.4. ran 26.0 for 200m and 58.6 for 400m. Under 17 Drumayne Moore ran in the 200m, stopping the clock in 26.4, but equalled his PB in the 100m running 12.7. He also competed in the pole vault, taking the gold medal with a best clearance of 2m 40. Under 13 Amber Hughes took 2nd place in her final event, the 200m running 28.4. Earlier, she excelled in the jumps with a Season's Best 1m 42 in the high jump, now just 1 cm off her PB set indoors in Sheffield last December. In the Long jump, her best of 4m 58 was a new PB by 13 cms, extending her lead at the top of the club rankings. Amber won both jumps competitions. Under 13 Sierra Jalloh won the 100m competition with 13.9. Under 13 Charlotte Hughes ran 13.8 for 80m, 2:13.6 for 600m and she cleared a best of 2m 90 in the long jump. Results will be published here in due course. Next Sunday, we have the Wigan Open Meeting, at the Robin Park Arena, possibly the last open T&F meeting of the season in the North West! The North West Road Relays incorporating the county Championships of Merseyside, Greater Manchester, Cheshire, Lancashire and possibly Cumbria (Kendal at least were competing in the event) were hosted by Cheshire County AA at Delamere Forest. The course was based on the trails around Blakemere Moss, with teams of three for most age groups, four for the Senior Men. The weather forecast was dire and indeed it rained solidly all day, the only variation being in the intensity of the rain. Everyone would have gone home very wet but the event was extremely well supported by clubs throughout the North West. Apart from the terrible weather conditions, the main disappointment of the day was the absence of a Southport Waterloo Senior Men's team! We didn't have an Under 11 Girls' team but one young lady - Erin Griffin - was game enough to make up a team with our Under 11 Boys. Our 'A' Under 11 Boys team finished 3rd in Merseyside, 7th of 32 teams overall, a very good result. Joseph Wake led off and ran 4:25 for the 1.2 km loop. James Simpson was next, running 4:59, slipping back to 12th team overall, and Luke Ward brought the team back to 7th with a fine run of 4:19. That was the 3rd fastest by a Merseyside boy and the 6th fastest leg overall. 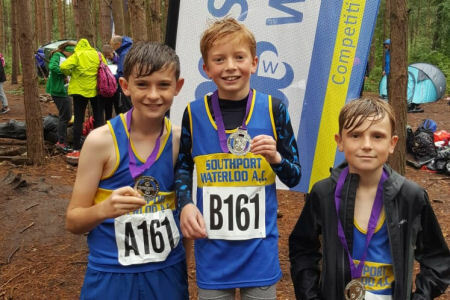 Our Under 11 Boys' 'B' team were Erin Griffin (5:08), Daniel Jones (5:12) and Charles Fletcher (5:01) for 7th Merseyside and 27th team overall. If Erin had been running with the Under 11 Girls, her time of 5:08 would have put her in the Merseyside top ten fastest girls!! Oddly, our Under 13 Girls' 'A' team was in fact our 'B' team (if that makes sense!) Elizabeth Wake led off running 14:45 for the 3.1 kms lap, finishing in 36th place, handing over to Libby Simpson who pulled back 7 places with a 16:17 run, with Emily Dean bringing the team home in 21st place, pulling back another 8 places. Emily ran 14:12 to bring the team home in 20th place of 40 teams overall and 5th Merseyside team, unfortunately just outside the medals. Our 'A' team comprised Apphia Keenan (14:55), Jemima Fletcher (15:34) and Lauren Byrne (15:29), 37th team overall and 9th Merseyside team. Our Under 13 Boys' 'A' team came 10th overall of 32 teams, but taking the Merseyside silver medals. Sammy Pickerill led off finishing 13th in 12:32, Monty Barr took over and ran 11:55 to bring the team up to 6th place before Will Collins completed the race running 13:33 for 10th overall. This perhaps isn't the form result expected and Monty is to be credittted with a great run today as our fastest in this age group. The boys finished 2nd Merseyside team behind Liverpool Harriers and ahead of Pembroke Sefton to take the county silver medals. We also had an incomplete 'B' team with Adam Byrne running 14:51 and Jack Bradshaw 17:41. Our Under 15 Girls' team finished 24th of 30 but with Olivia Logan running the 4th fastest lap, 2nd fastest in Merseyside. Holly Bradshaw led off with a run of 15:11 for the 3.1 kms, finishing 32nd, Olivia Logan took over and made up an incredible 17 places with a run of 11:38 and Millie Ireland brought the girls home in 24th with a run of 15:55. Although the girls were the 5th Merseyside team to finish they will have collected the bronze county medals. The Under 17 Women ran with the Under 15 Girls but competing for their own medals. 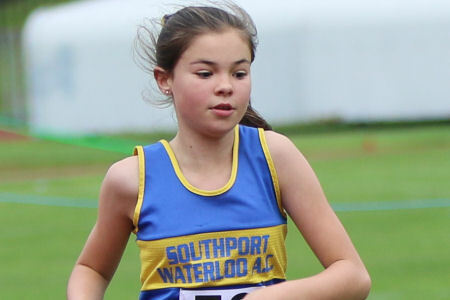 For Southport Waterloo, Jessica Dean ran first, finishing 12th in 13:45, again for 3.1 kms, handing over to Freya Walsh, picking up two place with a run in 14:14 and Lily-Ann Grayson brought the team home in 7th overall, picking up another three places. Lily-Ann ran 13:23. Southport Waterloo were the only club to finish a team in this age group so took the county gold medals. And naturally, featured in the fastest leg table Lily-Ann, Jessica and Freya 2nd, 3rd and 4th in the county. We didn't field a team in the Under 15 Boys, Under 17 Men or either of the Senior races. 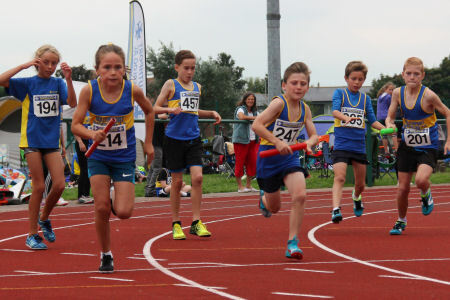 Saturday saw us hosting our annual open track & field meeting at Litherland Sports Park. This year was our 12th year of hosting an open meeting, starting in 2007 just a year after the Litherland athletics track was opened for training. 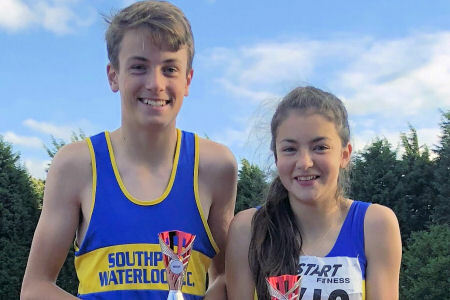 Numbers have built over the years and I'd like to think that it is now a firm fixture in the athletics calendar attracting athletes both locally, from throughout the north west and down as far as the Midlands. This year, pre-entries were a little down on recent years but with a fair weather forecast we had a good entry on-the-day and so totaled 329, exactly the same number as the record entry of 2017. Attracting athletes from further afield reflects the high standard of competition we offer. But this isn't an elite event, rather we are providing an opportunity for young athletes to take that first plunge into competition and there were plenty of our own youngsters doing just that on Saturday as well as others locally from Liverpool and the Wirral in particular. I think we had about 65 Southport Waterloo athletes competing which shows fantastic support for the event from within the club. Last year I said that "I don't think I can recall a T&F meeting where there were more Southport Waterloo athletes in action. And its not just numbers. The quality is a testament to the coaching now available at the club and the dedication that brings young talent to regular training sessions." I can only repeat that! There is lots of evidence in this year's results that shows young emerging talent as well as more established young athletes performing with growing confidence. This year, there were a number taking their first step in competition but also some incredible individual performances. The weather was warm, dry and calm but also a little oppressive so not ideal for PBs. Nonetheless our athletes achieved 34 Personal Bests and 4 club record performances. Harry Flanagan equalled his Under 20 200m club record of 22.0. 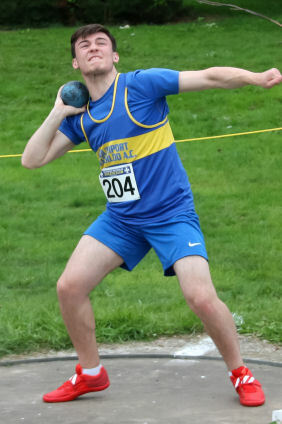 Adam Byrne edged past Marcus Burgess as the latest holder of the Under 13 3 kg shot club record with a put today of 6m 59, Sam Coupland cleared an impressive 1m 80 in a strong high jump competition to add 2 cms to his club record and Abigael Bamber added nearly 2 metres to her previous best shot to set a new Under 15 girls' club record of 9m 59. More than that!, we had 11 AAA's grade 1 standards; Amber Hughes with three, Sierra Jalloh with two, Rhys Hulse with two, Joe Kane with two, Sam Coupland with one and Harry Flanagan with one. Our Under 9 Girls were Amber Cliffe and Emily Jones. Amber won the 75m race in 12.6 and long jumped 2m 72 for a 3rd place. Emily ran a 2:29 600m. Our Under 9 Boys were Harry Clark and Hugo Syms. Harry won the 75m in 12.4 with Hugo 5th in 13.4. Harry long jumped 13m 37 and both boys took medals in the Vortex Ball throw, Hugo with a best of 13m 37 and Harry 12m 94. Our Under 11 Girls were Renee Adams, Lucy Brooks, Tiana Chambers, Felicity Fletcher, Erin Griffin, Charlotte Hughes, Megan Hulse and Hannah Keenan. Renee was fastest overall in the 75m and 150m running 11.7 and a PB 23.0. Hannah won her 75m heat in a PB 11.8 and she led the girls home in the 600m running a PB 2:00.6. Charlotte equalled her long jump PB with 3m 22 the best of our our competitors. She also achieved a PB in the Vortex Ball competition taking a medal with 20m 33. But Megan's best throw of 23m 90 won the competition. Our Under 11 Boys were Adam Bamber, Charles Fletcher, William James, Daniel Jones, Jamie Simpson, Joseph Wake, Luke Ward and Harry Williams. The boys achieved 9 PBs between them. Charles, Daniel and William all achieved PB in the 75m races but Jamie was the fastest winning his heat in 11.5 Over 150m, Luke was fastest, running a PB 22.3, with Joseph just behind in 22.6. Harry's 24.6 was a PB for him. The club did really well in the 600m race with Joseph winning in 1:50.8, a PB, and Luke taking 2nd place in 1:51.7. Out of the medals, both Harry and William achieved PBs in the long jump; 3m 37 for Harry and 3m 15 for William. Six of our seven boys took part in the Vortex ball competition and Adam emerged the stronger. Joseph's 26m 25 was a new PB but Adam threw 31m 35 to take 2nd place overall in a competition of 16 boys! Our Under 13 Girls were Jess Blanchflower, Lauren Byrne, Ellie Clark, Jemima Fletcher, Amber Hughes, Sierra Jalloh, Evie james, Elenor Jones, Jessica Keenan and Elizabeth Wake. The first of the 75m races for Under 13s saw the three fastest girls in Merseyside competing together. Amber emerged the winner in 10.0 with Sierra 2nd in 10.3. Amber also won the shot and javelin competition with bests of 10m 24 and 24m 88. All three of Amber's performances were grade 1 standards! Sierra went on to win the 150m race in 20.4, both her performances being grade 1s. Southport Waterloo girls took 2nd and 3rd in the 70m hurdles, Jessica running 12.4 and Lauren 13.1. There were just 4 PBs by the girls, in the long jump and javelin. Elizabeth long jumped 3m 68 and Evie 3m 37. Lauren threw the javelin 17m 81 and Ellie 17m 80. Our Under 13 Boys were Jack Bamber, Monty Barr, Jack Bradshaw, Marcus Burgess, Adam Byrne, Rhys Hulse and Sammy Pickerill. There were several good performances here but Rhys was the pick of the bunch. He won both the 100m and 200m races by a good margin in 13.2 and 26.2, a PB, and won the long jump with 4m 79. Both his 200m and long jump were grade 1 performances. Adam was 2nd in the shot competition with a best of 6m 59 which is a club record for the 3 kg weight. He also took the 3rd place medal in the high jump with a 1m 30 clearance. Jack Bamber was 2nd in the javelin with 28m 86 and 3rd in the hammer with 17m 69. Sammy took the 1st place medal in the 800m running 2:36.6 just ahead of Monty finishing 3rd in 2:37. Our Under 15 Girls were Abigael Bamber, Holly Bradshaw, Millie Ireland, Eleanor James, Lucy Milling, Katie Piercy, Niamh Procter and Hannah Williams. Despite a recent injury, Abigael had an impressive day. She was 2nd in the 100m in 13.0, a new PB, and she massively improved on her shot PB with three throws over 9 metres. Her best, 9m 59, won the competition and set a new club record for the 3 kg shot. Katie, who previously held the shot record, won the hurdles race with 12.9 and was 2nd in the javelin with a best of 28m 10. In the mixed 800m race, Eleanor was 2nd Under 15 Girl in 2:38 and Holly was 3rd in 2:47. And running with the seniors, Lucy took the Under 15 gold medal in the Mile in 6:10.9. There were several other PBs. Holly's 100m run in 14.4 was a PB. Hannah hurdled a 13.7 PB and her long jump of 3m 91 was another PB. Our Under 15 Boys were Leo Christian, Sam Coupland and Joe Kane. Leo won the hammer competition with 34m 64, 8 metres clear of the 2nd placed thrower. Sam won the high jump competition with 1m 80, a grade 1 jump and a new club record, adding 2 cms to his previous best. He was 2nd in the long jump with a best clearance of 5m 55 and he took another 2nd place medal in the 300m, running 40.4. Joe had to settle for 2nd place in both the 100m and 200m races behind Wirral's Ben Wallace. The 100m race was so close both runners were given a time of 11.6. In the 200m Joe ran 23.5. His 100m time equalled his previous best and 23.5 for 200m was a new PB. Our Under 17 Women were Amy Bloxsome, Lilly-Ann Grayson, Megan Howarth, Lauren Lewis, Eve McMahon and Stephanie Robertson. There were no PBs in this age group but all the girls won at least one medal. Lauren won both the 100m race in 13.1 and the long jump with a best clearance of 5m 19. Lilly-Ann was another event winner in the 800m in 2:27.Amy was placed 2nd Under 17 in the 200m race, finishing in 30.5. Stephanie took three medals. She was 2nd in the 300m in 46.8, 2nd in the long jump with a best of 4m 94 and 3rd in the hurdles running 13.4. Megan was the final medallist, 2nd in the javelin throwing a best of 30m 09. In the Under 17 Men's events we had Ethan Harrison, Drumayne Moore, Patrick Manchester and Luke Suarez competing. Luke won the long jump competition with a massive 5m 96 clearance, a new PB. He also ran 11.9 for 100m for 3rd place overall. Patrick won his shot competition with a new PB 9m 95. Drumayne achieved two PBs from his three events; 12.7 for 100m and 25.4 200m. Under 20 Men competed as Seniors in this meeting. Ben Apps was 3rd over 100m in 11.7. In the 200m, Harry Flanagan equalled his previous best to win in 22.0. Over 400m he was again the winner, this time in 50.3 secs. Darion Moore competed in both 200m, running a PB 25.1, and the 400m in 57.8. Nathan took the silver in the senior weight shot. Daniel Byrne was 3rd in the javelin with 33m 03 and Jack O'Neill was 4th with 30m 52. Senior Men Graham Boreham and Keith Swift competed, Graham in the 400m, taking silver with 56.3, and Keith in the 3000m running 11:10.9 for 2nd Senior Man. It takes many people to put on an open meeting and my thanks to all the volunteers and technical officials who made it happen, many from our own club but also with great support from colleagues in other clubs. 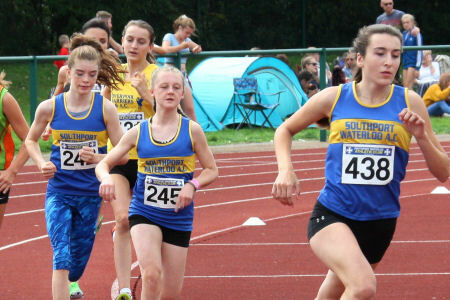 The meeting raises valuable funds for the club as well as providing an event where all our track and field athletes can get together and socialise as well as compete and support one another. There are too many to thank individually but perhaps I can single out: Steve Boreham who gave up his Friday to get the field facilities ready for competition and to the parents who baked cakes for resale, a welcome first at a Southport Waterloo hosted meeting! Most photos used were taken by Graham Boreham.